Dark, cigar shaped bird with long narrow wings and no noticeable tail. Often mistaken for swallows but they are not related. Chatters constantly as it flies and spends most of its waking hours on the air. Migrant returning mid May from Peru. Rest in chimneys during migration. Day shift feeder that screens the air for insects. 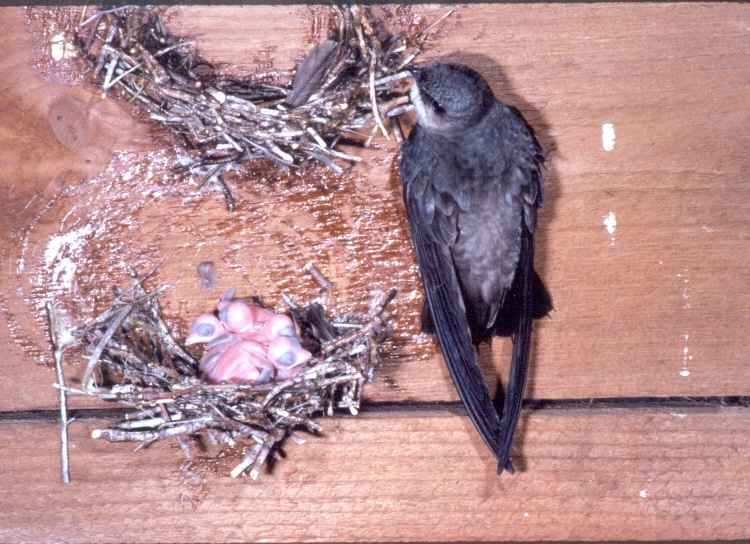 With the removal of old growth forests, for the past 150 years, swifts have depended on large chimneys for nesting sites. With fewer chimneys of that style, old barns and silos, they have lost their preferred nesting sites. Pesticide use particularly in wintering grounds. If you think your chimney has nesting swifts please don’t clean it during breeding season (May-September). Consider leaving your chimney unlined and directly vent your furnace.